While I'm using an orange/coral color here, feel free to use whatever color you want. To make it a true jelly manicure (also called pbj manicure), choose a polish that is buildable. to achieve the color in the bottle--those work perfect for this. 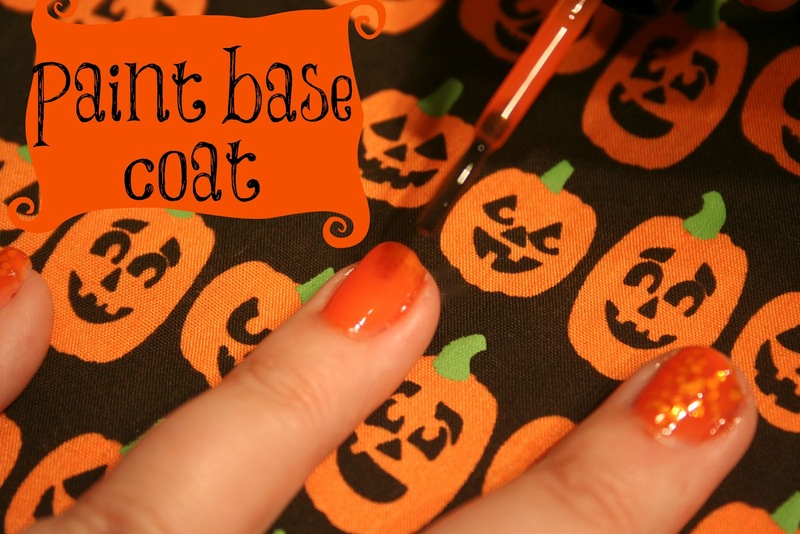 Paint one thin base coat of orange. Let dry. Paint one coat of glitter. Let dry. 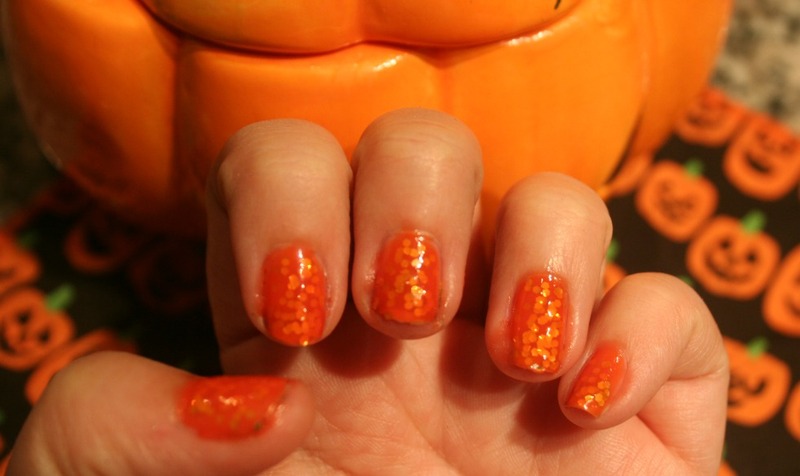 I like the chunky glitter polish better for this, as it shows the orange more. I also liked gold better than silver for this. Some of you might like it just like this--that's totally up to you! Paint top coat of orange polish. Let dry. Seal with clear coat if desired. The effect should be like the glitter is suspended in gel, hence the Jelly or PBJ name. Enjoy! What are you up to this weekend? I'm kinda excited about having no plans. Maybe I should curl up in the hammock with a good book? Tell me your plans. those look GREAT!!! I love how vibrant the color is. 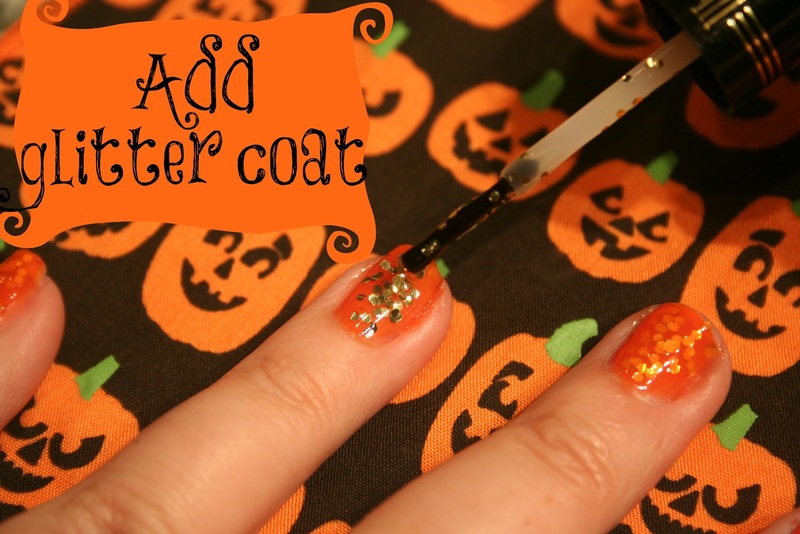 Most of the Halloween nail blogs I see are black, digging this!! PS no no no, I was NOT saying you airbrushed your blemish out! I was saying I was impressed because the makeup made it look that way! I actually tried this tonight, and mine turned out crappy. I probably should have used bigger glitter chunks. Yours look great though! love ur blog my dear! LOVE Zoya! That orange is pretty! This is great for halloween! No plans are good plans :) Have a great weekend. Very cute! Love the way glitter polish looks but I hate taking it off! Love this mani, so perfect for fall! Super fun nails! Seems simple enough to try! My weekend plans include some yard work and then going to roller derby with some friends. What fun! Thanks for inspiration, I think I may go with a black polish, purple-y glitter polish! So many options! Thanks for stopping by my blog. I've joined your followers. Can't wait to see what you come up with next! oooh totally like the jelliness of these nails, Elle! and the orange is actually really pretty and very fall-ish! How adorable, Elle! And it's Thanksgiving this Monday for us Canadians, so woohoo! 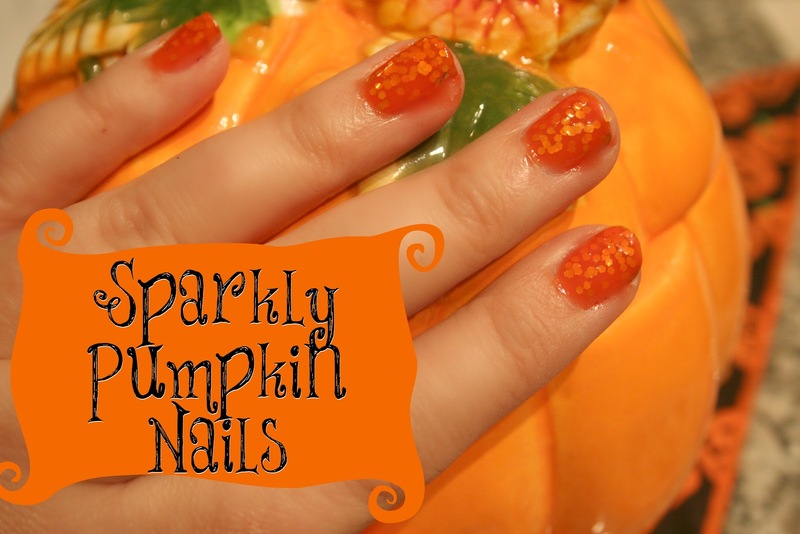 Love the pumpkin mani! Would go great with a pumpkin spice latte, ha! I have pumpkin spice creamer. this is a fun idea therefore you should always blog when you are hungry. Elle- love this mani-- orange/coral and gold is always awesome...so cute and the backgrounds are adorbs. Such a fun color! I am so into orange right now. So cute!!! I'll have to do this! Someone told me once that orange is the most seductive color. I don't know if that's true but those colors do look pretty hot. That looks great. It looks easy and I will try it. Pretty! I'll have to try that. omg ANYTHING pumpkin i LOVE! hello! i like your blog! im following you now, if you like my blog, follow me back please! These look amazing! I really need to try a jelly Sammy mani! Thanks for the tutorial! Definitely going to do this when it gets a littttle closer to halloween. Amazing nail art!! I love it! I've been enjoying going to the salon to get manicures but without the polish. Just the other day when I was doing yet another cull of my beauty products, I thought of you! I love the sparkle in this look Elle! lovely nail art! i didn't think of any halloween outfit and make-up yet. thanks for the lovely inspiration! I love it!!!!!!! Fun and festive!!!!! New follower via Bloglovin!!! LOVE this!! 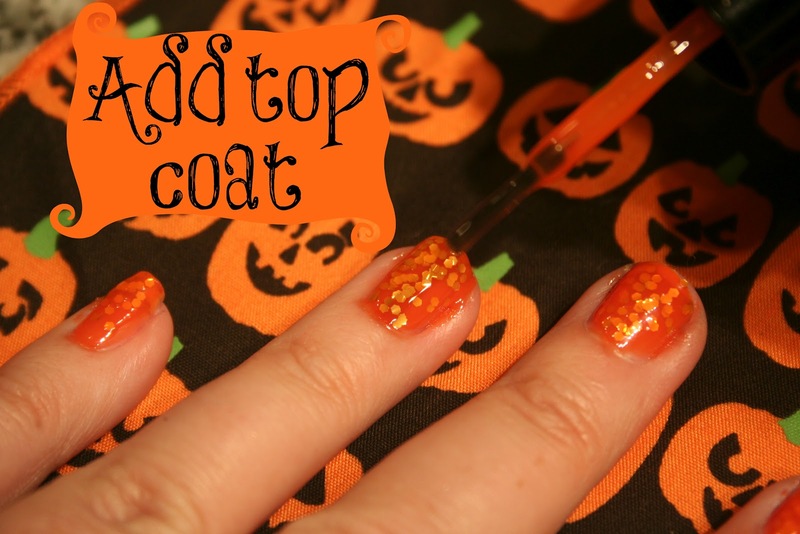 Perfect for the month of October :) I will definitely have to try this out! This is just the cutest orangey inspiration! Looks so lovely. P.S I have a special request Elle...have you done (or could you possibly do) a post on how to properly remove eye makeup and mascara and with natural non-astringent makeup removers? This is sooooooooo perfect for halloween, love! Aww love your nails! Cute background too! Ps. Now following you back! I love these nails, so cute :). Thanks for stopping by my blog! I love the nail polish that you used. I never wear nail polish on my finger nails. It always chips off too quickly. Plus, I lack the patience to sit long enough to let it dry. However, I do sometimes paint my toe nails! I may have to give this a try sometime. Following you back via GFC. Have a great day! Awesome nails! I really like it! Maybe we follow each other!? how fun!! I love them!! Wow - love your nails. So festive!